When ‘television’s biggest night’ is in its 70th year, one expects a little more from the show. It didn’t necessarily need to be a grander production or a flashier show, but something that can leave the audience with fond memories at least till the 75th year, if not for decades to come. 1. THE HOSTS: I won’t presume to know how good the comedians, Michael Che and Colin Jost are on SATURDAY NIGHT LIVE or anything else they’ve done. In fact, I’ll even give them credit for some of the jokes made. However, the delivery was not there. They didn’t command the audience’s attention, especially not the audience sitting at home. Maybe they were the wrong choice for the 70th Emmys, or maybe they just didn’t live up to expectations. I’m sure others will agree that it would have been wiser to go with someone tried and tested, such as Jimmy Kimmel or Tina Fey and Amy Poehler, and give Che and Jost a chance another year. Something tells me we won’t see these two hosting any major awards anytime soon. 2. MAYA RUDOLPH AND FRED ARMISEN: What was that! They probably expected a lot more to come out of this whole bit where the hosts expect them to know the ins and outs of the Emmys, but it fell flat from the word go, and there was no coming out of it. Perhaps the producers of the show should have nipped it in the bud after the first round of banter itself. The duo were obviously there to promote their new show, FOREVER, but this was probably not the best way to go about it. 3. OTHER PRESENTATIONS: It wasn’t just Rudolph and Armisen that gave me second-hand embarrassment, there were others too. When Larry David and Rachel Brosnahan likened presenting an award to a blind date, it was so weird and unfunny that I felt really bad for at least Brosnahan. Worse than that were Ben Stiller, Patricia Arquette and Benicio Del Toro, doing a bit about Del Toro mock-planning a murder or execution. Firstly, he was too far from the mic, and then with the awkward silence that followed, there might as well have been crickets. But the most annoying was Will Ferrell pretending like the walk from wings to podium was insanely long, and with that being the second-last award, they were really trying our patience. 4. 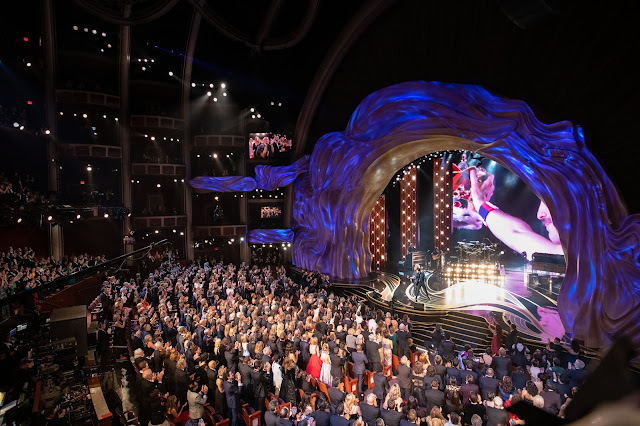 THE ANNOUNCEMENT OF NOMINEES: Probably to make the show crisper, the nominees were announced in voice-overs before the presenters came up to reveal the winners. That, however, did a major disservice to the presenters, as it resulted in their presence being less than justified. Once the nominees are announced, we’re only looking to hear the winner, so even the bits and sketches at that point that might have been good didn’t go as expected. Some still made it work, but there would’ve been no saving the presentations mentioned above. 5. 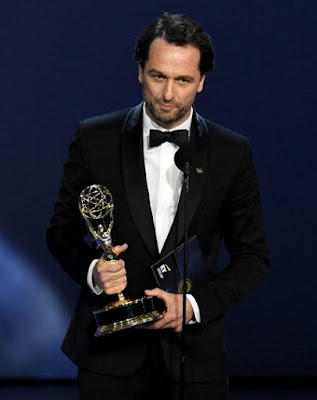 THE ACADEMY PRESIDENT AND THE REPARATION EMMYS: When the president of the Television Academy comes up to speak on the 70th anniversary of the Emmys, the least we could expect was a decent AV. It lacked the excitement that TV always brings into our homes, and I at least couldn’t wait to move on to the next thing. And the ‘Reparation Emmys’—it was weird and ineffective. I’m sure the intentions were good, but the idea and execution didn’t quite deliver. Still, there were some things that I really liked about the show. 1. THE OPENING NUMBER: It may not have been an amazing experience, visually, but it was quite funny. ‘We solved it’ they sang, and it drove home the fact that issues of diversity are far from over, but there’s a positivity and hopefulness about it now. In fact, I didn’t even see them as an all-minority performer ensemble, until the straight, white male, Andy Samberg showed up and became the minority in that situation. Of course, Ricky Martin’s entry and Latino spin was the icing on that cake. Like I said, it may not have been a spectacle, but it was effective, and went well with the minimalistic look of the stage this year. 2. PRESENTATIONS THAT NAILED IT: Andy Samberg made it work with both his appearances on-stage. He and Sandra Oh were the funniest presenters. They may have simply gone with material based on the Oscars-La La Land blunder, but that joke’s still hilarious, and they did it so well. I really want to see Sandra Oh in an out-and-out comedic role now! Also on point was Samantha Bee’s presentation. She spoke of the news being the ‘dystopian drama’ that she’s been following and how she feels that ‘the lead needs recasting’. Adding that Robin Wright would be better for the role became a double dig—at Donald Trump and Kevin Spacey. This was one of probably just a couple of politically-charged bits in the show. 3. MRS. MAISEL’S YEAR: This may have been the most predictable turn, but it was lovely to see THE MARVELOUS MRS. MAISEL getting recognized for its brilliance. 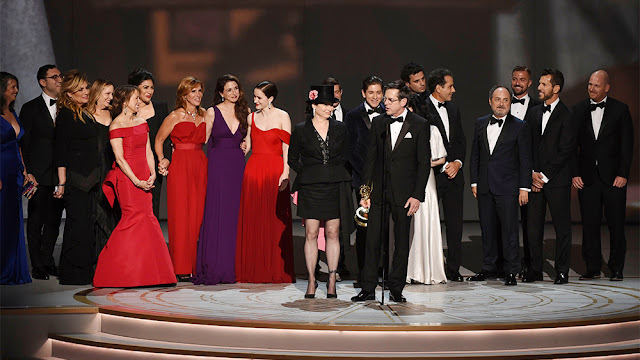 From Alex Borstein’s and Rachel Brosnahan’s supporting and lead actress comedy wins to Amy Sherman-Palladino’s Emmys for writing and directing in comedy, all were well deserved. The clean sweep was complemented by acceptance speeches that reflected the same energy that the show has exemplified in its first season, while it was also announced that the second season has just finished filming. 4. FITTING TRIBUTES: Two presentations did go well for the show. One was where they honored Betty White, the 96-year-old living phenomenon, who has been around for many of the seven decades of the Emmys. And the second was the ‘in memoriam’ section, introduced by Tina Fey in a seldom-seen somber presentation. Heartbreakingly poetic was seeing the tribute to Aretha Franklin, with her own iconic ‘Amazing Grace’ as the accompaniment. 5. 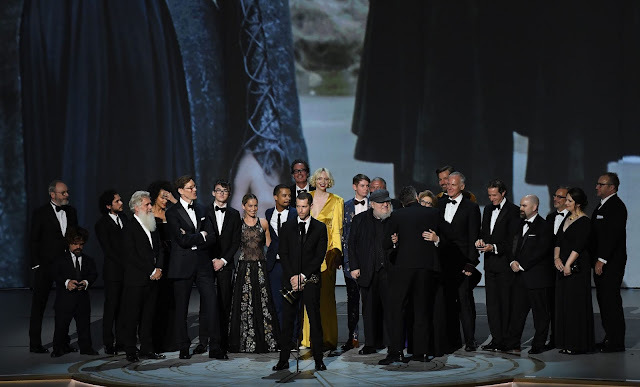 DRAMA SURPRISES: The most surprising and diverse section was drama, with wins from GAME OF THRONES to WESTWORLD, and surprisingly none for THE HANDMAID’S TALE. While it was sad that Yvonne Strahovski didn’t take home an Emmy for her character-defining turn in the second season of the show, it was still good to see Thandie Newton recognized for WESTWORLD, which she deserved. It also felt right that Claire Foy won for THE CROWN, which may have seemed like an award for her overall portrayal of Queen Elizabeth II through both seasons, but a deserved win nonetheless. The most pleasant surprises were the wins for THE AMERICANS for writing and for Matthew Rhys’ lead actor Emmy. I think the show deserved even more for its stellar final season and season finale, but it was fantastic that the members of the Academy found at least these performances deserving. And finally, the show came to an end with GAME OF THRONES winning outstanding drama series, and hence dethroning THE HANDMAID’S TALE.